MONTREAL - Womenswear retailer Boutique Jacob is resuming operations, although on a much smaller scale. Family owners are developing a plan to relaunch the business with five stores in Quebec along with online operations after exiting seven months of creditor protection under the Bankruptcy and Insolvency Act. Jacob has no hope of rebuilding a national brand after closing 91 stores last year and shedding some 990 employees. Instead, it will focus on locations in Montreal, Quebec City and Sorel-Tracy where the company started 35 years ago. The stores, located in buildings owned by founder Joey Basmaji, have remained opened through the liquidation process. "The nature of the business is still unclear in the sense that the strategic plan is still being developed but the important part for now is that bankruptcy has been avoided, we're retaining five stores for the moment and we're relaunching our e-commerce website," said Cristelle Basmaji, daughter of the company founder. The company's website just reopened with its only product being the popular Jacob perfume. But clothing collections will be added that are made mainly in Quebec and possibly elsewhere in Canada. Cristelle Basmaji said there are no plans to add more stores, but rather develop a new business model that makes sense in the current retail environment that has seen several chains close in recent months. "Since we closed doors a lot of other retailers in our business have (as well), so we know that we cannot go back to the business-as-usual model that we had before." She said creditors overwhelmingly accepted a proposal in December that provided them a "symbolic" payment. However, company founder and main creditor Joey Basmaji was not repaid. The company abandoned previous restructuring efforts last October after failing in its efforts to "breathe new life into the company." But Cristelle said her father wanted to continue because he still has "a love and passion" for the business. "We're just looking to keep the name alive and operate a smaller business that will keep our loyal customers happy," she said in an interview. 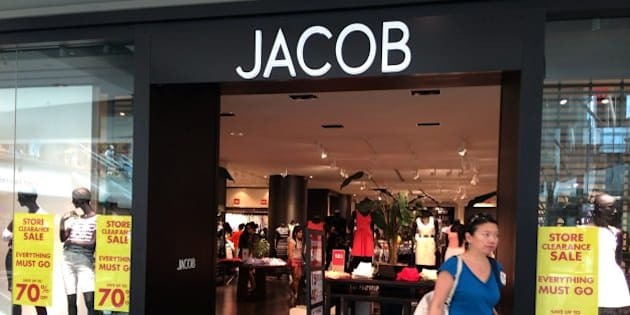 Like other retailers, Jacob faced intense competition from other clothiers, particularly international brands like Target, Zara, H&M and Forever 21, all vying for the same market share. Several brands including Smart Set, Bikini Village and Mexx are either closing or being sold.